EUROPEAN countries are making substantial investments in environmental protection. Amongst members of the Organisation of Economic Cooperation and Development (OECD) -- the Paris-based club of affluent countries -- Austria spends the most on environmental protection, as a proportion of its GNP. West Germany is second and now that the two Germanys are united, the combined nation's environmental investment is likely to increase. Industrial firms contribute in large part to this national investment in several of the countries -- from a low of 11.5 per cent of the total expenditure in Denmark and 12.1 per cent in Japan, to about 60 per cent in Austria and West Germany. 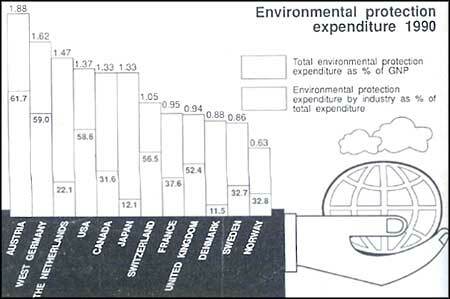 And, West Germany's environmental protection expenditure has increased from DM 8 billion in 1980 to DM 21.1 billion in 1990. The state plays an important role in encouraging industry to take up environmental protection measures. Projects are regularly assessed for their possible environmental impact, even though environmental authorisation procedures vary from an average of 2-5 months in USA to 6-13 months in Switzerland, 6-22 months in Germany and 18-24 months in Sweden. Those ever ready to criticise the Union ministry of environment and forests, for its delays in environmental clearances, may find it sobering to realise that industrialised countries are not doing much better.